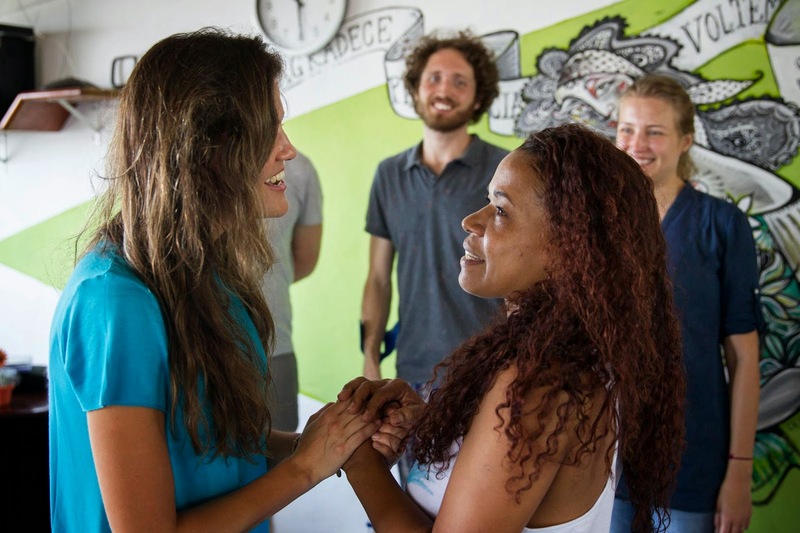 We recently received a visit, and a generous donation, from international lodging rentals website Airbnb. So why would Airbnb want to visit a music school in the middle of a favela? The reason is that renting rooms via Airbnb is a central part of the financing of our project. I rent out 3 rooms in my house in the favela (which is also where we do our lessons), which puts me in a financial position to be able to work on Favela Brass pretty much full-time on a voluntary basis. I met Carolina Martins from Airbnb São Paulo whilst playing at a samba party in Rio and when Airbnb's head of global citizenship, Mark Levy, decided to make a visit from their head office in San Francisco to see Brazilian charities in Rio, Carolina saw the connection with Favela Brass and the visit was arranged. 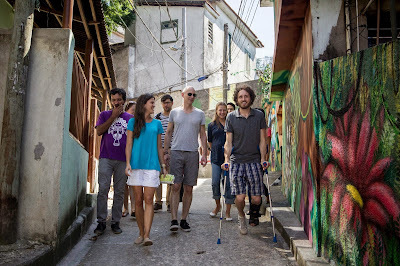 After a breakfast laid on especially for us at local restaurant ABCD, our group, which included the Airbnb staff, local Airbnb hosts (there are plenty within the favela), Favela Brass teachers, designer and saxophonist Pedro Pamplona, four of the older children and their grandma, went on to the school. 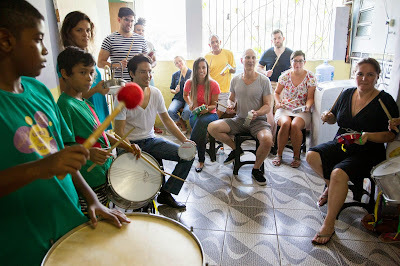 After a short performance from the children on brass and percussion the whole group participated in a samba percussion workshop, with the kids helping to teach the adults the rhythms. 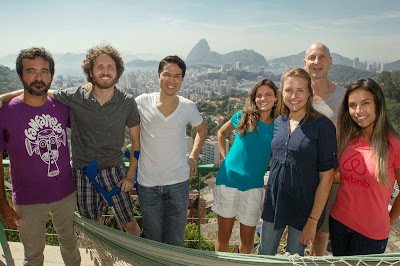 Airbnb didn't just visit our project, however. They also very generously donated sufficient funds to the project for the hire of a professional designer to create a unified visual identity for the project - a logo plus 5 other design applications of our choice, which could include a banner and background for our blog, stickers for our percussion instruments, facebook flyers for our school events, a flag for the project in the classic samba school style, or anything else we can dream up... Designer Pedro Pamplona has even offered to do a giant spray paint version of the logo on our wall! 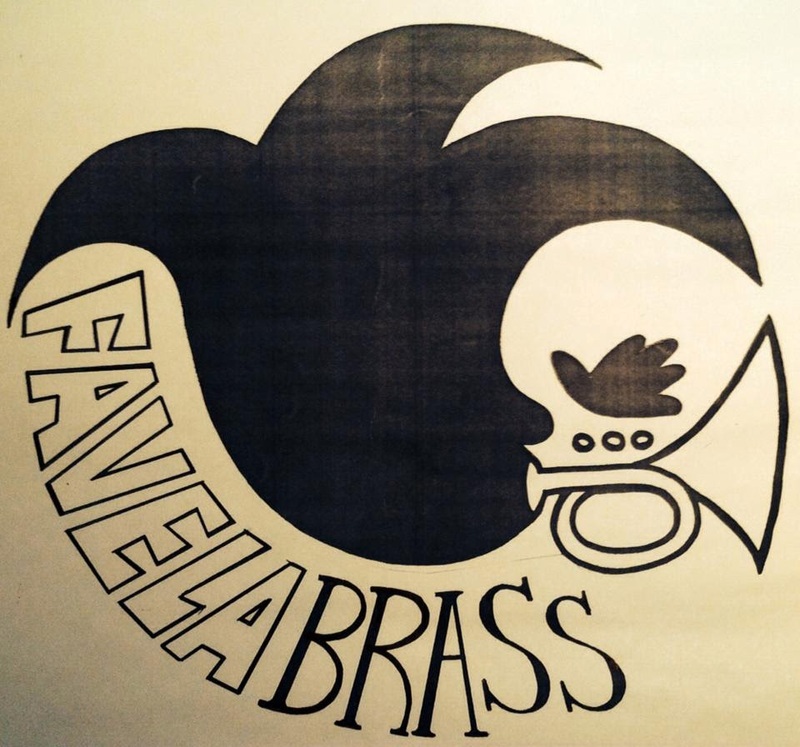 We asked professional designer and musician Pedro Pamplona to do the design work. 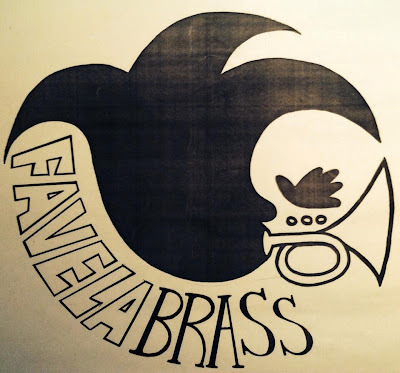 Here's his initial draft for the new logo which I already think is an absolutely inspired job! Huge thanks, of course, to Airbnb for the very generous donation towards our artwork and to Pedro Pamplona for agreeing to take the job on. Big thanks to restaurant ABCD for going out of their way to open their restaurant up exceptionally for breakfast, and for the lovely spread and delicious selection of tropical juices! 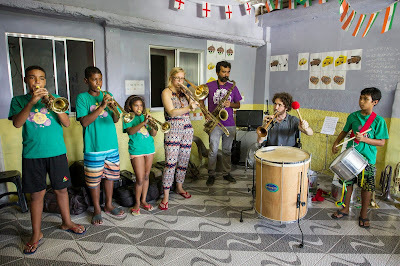 Thanks to Favela Brass students Vinícius, Gabriella, Victor-Hugo and Patrick for the great show and help with the percussion workshop, and to their grandma, Aparecida, and Favela Brass teacher Sigrún Jonsdötter for looking after them. Thanks also to local Airbnb hosts Axl Lahaye, Petra Kullnig, Zé Maria, Anna Kahn and Ricardo Bêis for coming along and supporting, and thank you also to Carolina Martins, Mark Levy and all of the Airbnb staff from São Paulo for coming to visit our project and community. We'll be posting further versions of the logo as it progresses here on the blog and welcome any opinions! PS - We super enjoyed the LOGO!! Totally awesome!! Congrats!!! !